Over 80 step-by-step recipes to get you up to speed with building your own wxPython applications About This Book * This book empowers you to create rich cross-platform graphical user interfaces using Python * It helps you develop applications that can be deployed on Windows, OSX, and Linux * The recipes in the book involve real-world applications, giving you a first-hand experience of the practical scenarios Who This Book Is For For those who are familiar with programming in Python and want to start building applications with graphical user interfaces, this book will get you up and running quickly. A basic understanding of the Python programming language and object-oriented concepts are all that is needed. What You Will Learn * Create full featured user interfaces * Design and develop custom controls * Deploy and distribute wxPython applications to Windows, Macintosh OS X, Linux, and other UNIX-like environments * Handle and respond to application events * Manage and display data using grids * Interact with web services from your GUI * Use Paint events to draw custom displays * Support the display of user interfaces in multiple languages In Detail wxPython is a GUI toolkit for the Python programming language built on top of the cross-platform wxWidgets GUI libraries. wxPython provides a powerful set of tools that allow you to quickly and efficiently building applications that can run on a variety of different platforms. Since wxWidgets provides a wrapper around each platform's native GUI toolkit, the applications built with wxPython will have a native look and feel wherever they are deployed. This book will provide you with the skills to build highly functional and native looking user interfaces for Python applications on multiple operating system environments. 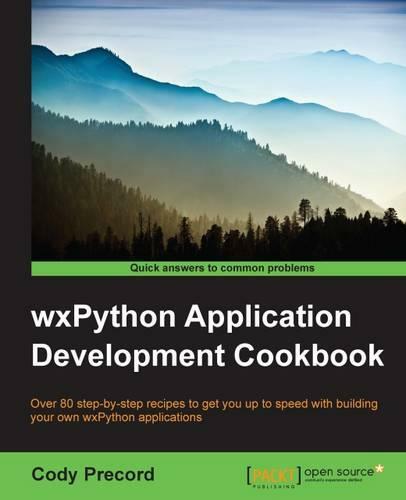 By working through the recipes, you will gain insights into and exposure to creating applications using wxPython. With a wide range of topics covered in the book, there are recipes to get the most basic of beginners started in GUI programming as well as tips to help experienced users get more out of their applications. The recipes will take you from the most basic application constructs all the way through to the deployment of complete applications. Style and approach This book is a collection of step-by-step recipes that introduce the various components and concepts of wxPython in a conversational and easy-to-follow way. Each recipe contains coded examples along with detailed explanations about the key points of each topic. Each topic is designed to introduce and show you how to use a single feature from the wxPython library.